Slim Fast Flim Flam Diet Plan! Just Say NO to Dead Food! Home / Diet & Weight Loss / Slim Fast Flim Flam Diet Plan! Just Say NO to Dead Food! Do you ever wonder why you try to do everything right and you keep getting fatter and fatter? And why you cant seem to lose your cravings for sugar? Heres a clue Sugar feeds the nasty Candida in your body &amp; Candida makes you crave SUGAR &amp; sugar makes you FAT! And as you can see from the image above, the Slim Fast Flim Flam bar is FULL of sugar sugar sugar sugar sugar sugar sugar sugar (need I go on)? If youve been following this blog very long, you know Ive been on my fair share of diets including the Slim Fast Flim Flam Diet and other unhealthy diets that prey on people who hate their fat selves and would do just about anything for the dream of being thin. If youre not familiar with my long and sordid tale, you can read all about it on my ABOUTpage. Having been where Ive been, I make no judgments on the wonderful, loving, just-want-to-be thin people who are so desperate theyll do anything to just drop some extra pounds including throwing down their hard earned money and starving themselves on dead food otherwise known as the Slim Fast Diet Bar (or Drinks). I do, however, make judgments on the companies who sell us on the dream of slim bodies and better health by eating their dead food. Its a promise they cant deliver on by the very nature of their products. And so there you are left with a desperate dream and a cupboard full of crap Slim Fast Diet Bars/Drinks. I get it. I know the feeling. Ive been that desperate to lose weight too! This isnt going to be a long blog post. You know my feelings by now dead food makes for dead people. Dead food eaters might still be walking around but quite literally theyre dying inside. Trust me, I know. Theyre suffering from depression, obesity, diabetes, high blood pressure, high cholesterol, candida, and so much more! 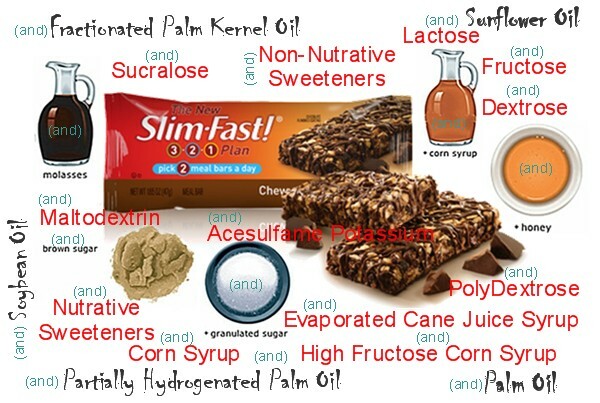 Have a look at the graphic above and the list of ingredients in the graphic below, and youll see just how much sugar (in all its varied names), and nasty oils are in these puppies. All of the items Ive highlighted in yellow are sugars; in all their nasty configurations. Go ahead take a look Ill wait right here. OK, good youre back now. Are you as appalled as I am? Holy crap, Batman! 16 DIFFERENT SUGARS and some of them repeated more than once whatever Im supposed to deduce from that! And guess what Sugar makes you FAT! Healthy fat doesnt make you fat SUGAR MAKES YOU FAT! But thats not all sugar does take a look at this Dear Sugar, Its Over. Youve probably beaten yourself up more than once for being a weak-willed loser who cant seem to stick to any diet long enough to lose the weight. Again, youre not alone and its not your fault. Youve been lied to by mega-giants who have mega-bucks to deceive you into believing they hold the answer to your weight loss dreams. They dont. Not by a long shot. Sugar filled products feed the very candida that drives your sugar cravings. Its a vicious cycle. Eat sugar &gt; feed hungry, nasty, selfish candida &gt; crave more sugar. Eat sugar, crave sugar. Eat sugar, crave sugar. If youve ever felt like you just cant get enough sugar, youre probably trapped in the candida cycle! You wont get out until you stop feeding the candida monsters and you wont stop feeding them as long as youre eating sugar filled diet bars (or any other processed sugar items, for that matter). Does this mean youll never have sugar again? No. That wouldnt be realistic, but you must step away from the sugar until youve cured yourself of candida. Once the candida is gone, you can have an occasional sweet treat, but I only recommend Coconut Secret Raw Coconut Crystals. Why? Well, you can read all about it on the link I just gave you . The only way to lose weight and keep it off for good is by stepping away from processed foods (including diet bars, drinks, powders and potions) and eating nothing but whole foods unprocessed (and living as often as possible) in all their delicious glory. Ive read oodles of diet books in my time, and some of them have amazing information, but most of them are filled with gimmicks of one kind or another. There is one book that stands apart from all the others and it is a diet (life) plan based on whole foods and sound science. I love it. I cant speak highly enough about it. I wish Id known about it when I was in my twenties and I could have saved myself decades of heartache and diet merry go rounds. The Harcombe Diet fully and beautifully explains how one of three conditions keeps us craving all the wrong foods and how eating whole foods the Harcombe way can turn it all around. When I started this post, I didnt have any intentions of mentioning this book, but as I wrote it, I couldnt help myself. I just had to tell you about it. This book is so amazing I havent stopped talking about it since I read it. I think its life changing. If youre still struggling to lose weight and if youre reading a post about Slim Fast Diet Bars, I presume you are dont despair. There IS an answer and its easier than you might think! Step away from processed foods, diet bars, drinks, shakes, and other crap, and run towards whole, living food, as quickly as possible. Make no mistake about it, Slim-Fast is a dead food. Every one of its ingredients has been pasteurized, processed, refined, cooked or otherwise destroyed of any living properties, making Slim-Fast just like all the other processed dead foods sold in grocery stores dead and devoid of any real phytonutrients, but loaded with cheap, dead ingredients like partially hydrogenated oils and sixteen different sugars. Peace, Love, and Whole Food Goodness! Why Am I Fat? The Surprising Effect of Chemicals In Your Environment! The Secrets Out Coconut Secret is the BEST Alternative to Sugar!